Governor Palin spoke at 5 events in 5 different states from Thursday of last week through Sunday of this week (4 days). A veritable marathon! No wonder the haters are coming out in force attempting to discredit her this week! On Thursday, April 24, Governor Palin, Senator Ted Cruz, and Senator Mike Lee campaigned for T. W. Shannon at the Liberty Rally in Tulsa, Oklahoma. Posted: Thursday, April 24, 2014 9:29 pm | Updated: 10:53 pm, Thu Apr 24, 2014. The large and enthusiastic crowd at the Green Country Event Center in east Tulsa liked them a lot. Those at the campaign rally shouted their approval when one of Shannon’s friends, Sen. Mike Lee of Utah, said he was glad to be back in the United States after spending time in Washington, D.C. It turned giddy over the appearance of former vice presidential nominee Sarah Palin, wearing a sequinned University of Oklahoma T-shirt and talking a mile a minute. Palin brought energy and personality to the stage — and an us-versus-them attitude. Ultimately, though, the stage was Shannon’s, and he made good use of it. An engaging speaker who hits all the right notes for his target audience, he added onto his friends’ populist chorus. Read more. Tulsa World also has a video here. Thank you to everyone who joined Ted Cruz, Mike Lee and me in Tulsa to rally for T.W. Shannon for Senate. T.W. has got a great future ahead of him as a new voice for conservative action in D.C. We need this dynamic leader in Washington! Also, a big thank you to Burn Co. Barbecue in Tulsa for providing the great grub! Their BBQ ribs clobber moose meat. I must admit. Heavenly. Along with T.W. Shannon who’s going to show Washington some Oklahoma thunder, Burn Co. is another reason Oklahoma can be so proud! On Friday morning, April 25, Governor Palin campaigned with Senators Cruz and Lee and Kay Orr at a rally for Ben Sasse at Scout’s Rest in Nebraska. “I’m here supporting Ben Sasse because I believe he has the courage to look in the eyes of the party bosses in Washington and say, ‘I don’t work for you, I work for the people of Nebraska,’’’ Cruz said, according to the World-Herald. NORTH PLATTE, Neb. — Two Republican rock stars and a cast of backup singers brought their act to Nebraska Friday for U.S. Senate candidate Ben Sasse as the state’s GOP primary heads for a wild finale. Tea Party favorites Sarah Palin, a former vice presidential candidate, and Sen. Ted Cruz of Texas rallied a crowd of about 1,000 to support Sasse in the May 13 primary. The band of politicos staged their show at Buffalo Bill State Historical Park, against the backdrop of colorful western showman William F. Cody’s cavernous horse barn. Sharing the spotlight were Sen. Mike Lee of Utah and former Nebraska Gov. Kay Orr. Sasse said he was grateful to have their support during the final days of the campaign. Palin, a former Alaska governor, said Sasse is the clear conservative choice in the election. Cody established the North Platte ranch in 1878. It was here that he created his Wild West Shows that toured the United States and Europe. Orr was governor when she hosted President Ronald Reagan at Scout’s Rest Ranch in 1987. Palin’s endorsements are valued by conservative candidates. Earlier this month, she endorsed Nebraska GOP gubernatorial candidate Pete Ricketts. Two years ago, she endorsed Deb Fischer in the final week of a hotly contested GOP primary race in Nebraska. Fischer went on to win the Senate seat. Besides Sasse, Palin has endorsed Senate hopefuls recently in Georgia, Iowa, Minnesota, Ohio and Oklahoma. Sasse said Palin — who wore a red light sweatshirt with a jeweled Nebraska “N” to the rally — arrived in North Platte on Thursday wearing Oklahoma Sooners shirt after campaigning in Tulsa. Sasse joked that he considered postponing the event to investigate her character. Sasse said Cruz was supposed to wear a Husker shirt, too, “but he didn’t keep his word.” At that, Cruz flashed a Texas “Hook ’em, Horns” hand sign to boos and laughter from the crowd. Thank you to everyone who joined Kay Orr, Ted Cruz, Mike Lee, and me this morning in historic North Platte, Nebraska, to rally for Ben Sasse. Ben will be a great advocate for conservative action in the Senate! He’s just the sort of problem solver we need to take on Obamacare and provide a conservative alternative to the challenges facing America! Special thanks to the gracious people at La Quinta Inn for their hospitality and delicious carrot cake cupcakes and to the Espresso Shoppe in North Platte for their awesome coffee! PS: In that photo with Governor Orr, I’m holding a ticket from the event Governor Orr hosted for President Reagan in North Platte back in 1987 at the Buffalo Bill Historical State Park! On Friday evening, April 25, Governor Palin spoke at the Baldwin County Republican Party’s fundraising dinner in Orange Beach, Alabama. Retrieved from Orange Beach Babe. h/tp Isabel Matos. RANGE BEACH, Alabama – Former Alaska Gov. Sarah Palin offered plenty of red-meat attacks on President Barack Obama during an appearance at the Baldwin County Republican Party’s annual fundraising dinner Friday, but she did not spare her own party. Palin, who rocketed to political stardom after presidential candidate John McCain tapped her as his running mate in 2008, expressed nearly as much exasperation with the GOP establishment as she did with Democrats. She referenced her own upbringing in an Alaskan hunting family in declaring that she would fight politicians that conservatives deride as “Republicans in Name Only” during intra-party squabbles. “I’m not afraid at all to go on a little RINO hunt,” she said. Since her unsuccessful bid for vice president, Palin has devoted a great deal of energy toward supporting like-minded Republicans in primary battles, whether they be incumbents or challengers. Along the way, she has become one of the top draws on the speaking circuit. Baldwin Republican Chairman Matt Simpson said it was a big coup to get Palin. He declined to say how much the party paid for her appearance and said the former governor agreed to an interview only with Yellowhammer News, a conservative blog in Alabama. Simpson said about 500 people attended the speech at The Wharf in Orange Beach. The audience included most of the county’s Republican leaders, along with the chairman of the state GOP, U.S. Rep. Bradley Byrne, R-Fairhope, Republican leaders from the rest of the state and even a U.S. Senate candidate for Louisiana. Turning serious, Palin questioned the commitment of some Republicans to repealing the Affordable Care Act, Obama’s signature legislative achievement. “They’re giving a lot of lip service to it, but it’s not happening,” she said. The reason, Palin suggested, is that some Republicans have concluded they are better off raising campaign contributions off of the issue and leaving the law alone. She said too few Republicans in Congress supported efforts by Sens. Ted Cruz, R-Texas, and Mike Lee, R-Utah, to shut down the federal government in order to force the defunding of the health reform law. “They left some of our guys out there alone,” she said. “Worse than that, they joined the lapdog media” in condemning Lee and Cruz. Palin urged Republicans to “send reinforcements” to help tea party Republicans in Congress. She paraphrased a famous Obama quote in crediting the tea party for engineering the Republican takeover of the House in 2010. “Republican establishment, you didn’t build that – the tea party did that,” she said. Referencing big Republican electoral gains in Alabama since 2010, Palin held up the state as a model for the nation. “Alabama really is the picture of this – especially Baldwin County,” she said. Palin had plenty of fire for Obama and the Democrats, too, starting with the “Orwellian boondoggle” of Obamacare. She blasted the administration over the National Security Agency spying scandal, the murder of the American ambassador in Benghazi, Libya, and Obama’s response to Russian aggression in Ukraine. Palin got her biggest applause and a standing ovation for her defense of America’s veterans. She decried cuts to veterans’ health benefits and Obama’s proposed defense cuts. “They’re the ones who should be getting the free ‘Obamacare,’ not the prisoners,” she said. Kirby also wrote about members of ‘Sarah Palin’s Earthquake Movement’ from around the country who filled 3 tables at the rally. Members said the speech was the first Palin event they attended as a group but that members have gone to other appearances individually. “It was mostly to show we support her,” said Sandra Bailey, a New Mexico woman who founded the group. Organizations said the group has 2,300 members hailing from all 50 states and Canada. “We support who she endorses,” said Linda Armstrong. Wayne Mazza, a member from Pennsylvania said Palin’s great record as mayor of Wasilla and governor of Alaska is the second-biggest secret in American politics behind only President Barrack Obama’s questionable associations before his election as president in 2008. A photo gallery, including the photo above, by photographer Brian Kelly can be found here. On Saturday, April 26, Governor Palin spoke at the NRA’s ‘Stand Up and Fight’ rally in Indianapolis. 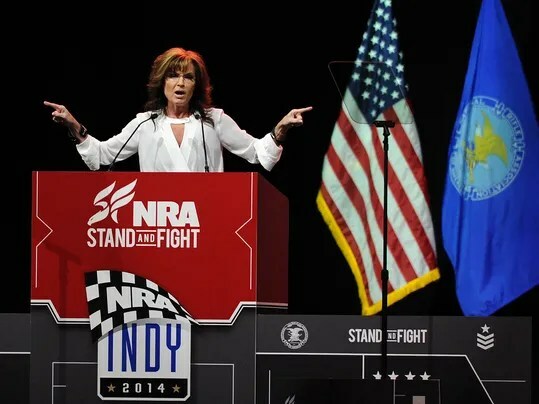 The former governor of Alaska, who ran for vice president in 2008, gave a rollicking address at the NRA’s April 26 “Stand Up and Fight” rally at its 2014 annual meeting held at Indianapolis’ packed Lucus Oil stadium. Palin mixed humor and rhetoric to whip the crowd in a cheering frenzy. The biggest lines of the speech were in her discussion of foreign policy and terrorists. The Alaskan said President Barack Obama’s foreign policy has it backwards when it pokes our allies in the eyes and coddles our adversaries. 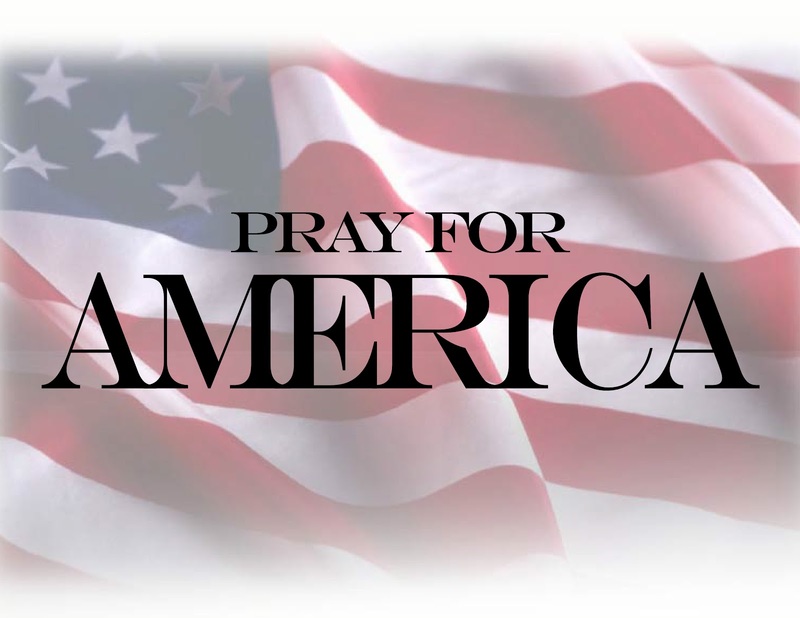 Too often we worry about hurting the feelings of people looking to kill us and we use fuzzy language, such as Obama’s description of the 2009 Fort Hood shooting by an agent of jihad wearing an Army uniform as “workplace violence” not terrorism. “We need to put the fear of God into our enemies,” she said. She said she has always watched Palin on TV since the former Alaska governor stepped into the spotlight as the GOP’s vice-presidential candidate in 2008. When she found out that Palin will be in town for the annual National Rifle Association convention, Ricks didn’t miss the opportunity. “Yeah, I carry a gun because a cop is too heavy,” Palin said amid cheers. Chris Stanley, an NRA life member, said Palin’s brief speech underscored what the majority of Americans already believe. “She reiterated the point of the Second Amendment and the constitution and what the founding fathers wanted,” the Westfield resident said. 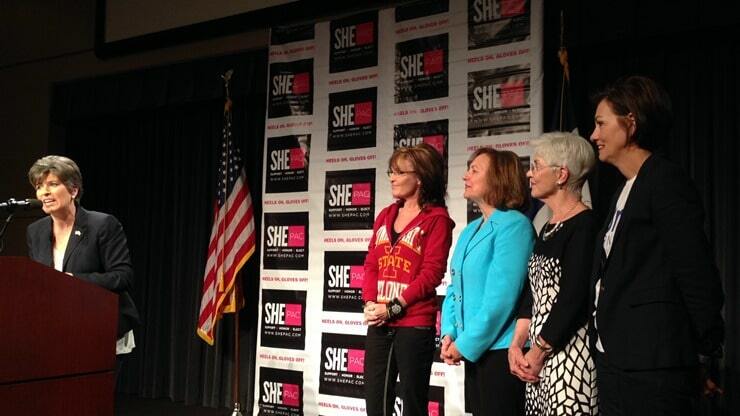 >On Sunday, April 27, Governor Palin spoke at the Heels On, Gloves Off Rally sponsored by ShePAC in Des Moines. Sarah Palin gave GOP U.S. Senate candidate Joni Ernst rave reviews during a rally Sunday in Iowa. “I haven’t been this excited about a candidate in quite a while,” Palin said. The country needs politicians who can be counted upon to “buck the establishment” and “do what the people, in this case of Iowa, will be sending her to do for us,” Palin, a former vice presidential candidate, said during a ShePAC’s “Heels On, Gloves Off!” rally in West Des Moines. Read more and watch a video of Governor Palin’s speech here. Well that was a great experience in Iowa yesterday with an amazing group of “mama grizzlies” rallying to support U.S. Senate candidate Joni Ernst! Thank you to everyone who joined Lt. Governor Kim Reynolds, Senator Deb Fischer, and Governor Kay Orr at this “Heels On, Gloves Off” Rally. Special thanks to ShePAC for hosting the event and for fighting to Support, Honor, and Elect conservative women like Joni! It’s imperative we work together to send this soldier, mom, and America’s favorite Iowa pork farmer to Washington to make the big spenders squeal. Also, thank you to our guys – Gail Ernst, Bruce Fischer, and Todd Palin – who jumped in with great help to support this worthy conservative candidate. Please join the team that will send Joni to the U.S. Senate to get America back on track. P.S. Here are some photos of Joni’s campaign bus.